Ron Meyer grew up on Detroit's northwest side and attended Detroit Public Schools; graduating from Redford High School. While in high school Ron was already winning awards for his photography. This included the coveted Best-in-State 1967-68 Quill and Scroll, for high school and college students. Later his photography helped support him while he attended the University of Arizona and the University of Maryland. Meyer grew up with a camera in his hand. His first professional work was shooting weddings and working for Copy Craft Inc. At Copy Craft Inc. he performed a wide range of location assignments as well as studio portraiture work, all between the ages of thirteen and sixteen. When he turned sixteen; Ron was hired into the Detroit Suburban Newspaper chain as a copy boy in the photographic department. Shortly before his seventeenth birthday he was promoted to manager of the photographic department. Part of his job included delegating photographic assignments to staff and stringer photographers, supervising the darkroom operations, as well as increasing overall quality control. Ron served in the U.S. Air Force as a photographer with duties including training other photographers. Later he was attached to the Office of Special Investigations (OSI). By the time he was twenty-one, his talent with a camera had earned him the privilege of fulfilling photographic assignments while traveling with the Apollo 15 Astronauts and then-President Richard Nixon. Ron’s art has been shipped to many galleries throughout the United States and Canada. Interior decorators also feature his work in their collections. Ron’s work is displayed in corporate offices, resorts, homes and cottages. Ron continues to win awards for his photographs including 1st, 2nd, and 3rd, place ribbons at the 2009 Bay City Waterfowl Festival. The 2010 Spring Great Lakes Art Fair had over two hundred participating artists from throughout North America including fifteen top named photographers. Ron Meyer won the People’s Choice Award. In 2010, Ron was the featured wildlife photographer at the Bay City Waterfowl Festival. As part of that festival he was invited to present classes in wildlife photography. The auditorium was nearly full for these classes and included photographers from throughout Michigan and other states. Over the years Ron has given many classes in photography. 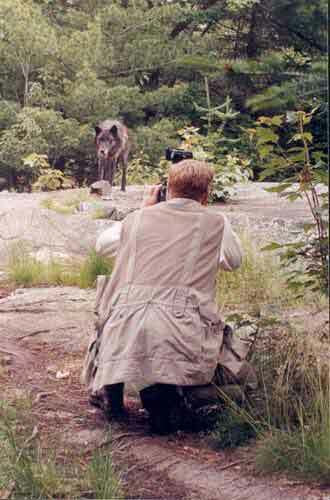 He was the first to give classes in wildlife photography at the Michigan United Conversation Club’s Out-door-rama. Teaching photography to others is Ron’s way of giving back. He says, “I would not have the reputation I have today if it were not for the people who took the time to help me when I was starting out.” As an offshoot of his classes Ron has authored NATURE IS YOUR STUDIO, a photographic how-to book and field guide for nature photography, currently sold out. Ron was honored to be the wildlife art judge, both amateur and professional classifications, for the 2005 and 2010 Michigan State Fairs. Over the years Ron has judged numerous art and photographic competitions. However, the Michigan State Fair competitions are the most challenging because they require Ron to judge multiple mediums in the same category. Ron first children’s book, Freddy Fox, debuted in the spring of 2005 with great success and went into its second printing in less than two and a half years. In 2008 it won the Moms Choice Silver Award. Casey Cougar, co-authored with his wife Diana, joined Freddy Fox on bookstore shelves and at art fairs in 2008. Ron uses his photographs to illustrate these 9” x 12” full color books. The stories are intended to teach children lessons we want our children and grandchildren to learn. The photographs fascinate the child in all of us. Both books have been called the perfect holiday, birthday or no special occasion gift for the child in your life. After working in one form or another of the photographic industry for over forty years in 2006 Ron and Diana became semi-retired and moved to the Oxford area. They bought property which includes a creek, a pond, meadows and dense woods where Ron continues to pursue his love of wildlife photography.